The 2018 Canadian Innovation Conference, was hosted by the PCMA Canada East Chapter, in partnership with the PCMA Canada West Chapter and held in beautiful Victoria, BC. The conference was designed to provide a high caliber of educational content in an effort to meet the needs of meeting and event professionals and suppliers whose organizations are engaged in providing services related to the conduct and operation of meetings, conventions, seminars, exhibits and trade shows customized to the Canadian market. Bespoke Audio Visual was proud to attend #PCMACIC18 and learn alongside our industry partners. 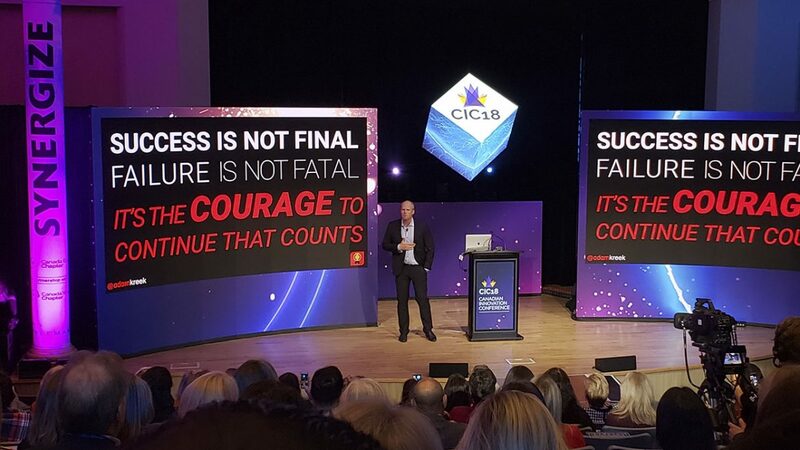 Here are my 3 takeaways from the 2018 Canadian Innovation Conference. WestJet chartered a flight from Toronto to Victoria (VIPlane) with sponsors such as Bespoke Audio Visual, for business partners and clients. This unique idea was a great success giving everyone a chance to connect, network with peers and listen to a great speaker while flying to #PCMACIC18 in Victoria. They say a room plays a big part in getting a message across. At #PCMACIC18 each concurrent session room had a theme that made for a more comfortable setting. Because of this attendees were more apt to get involved and ask questions. PCMA covered the hot topics of the day that encompassed everything from what is involved in planning a conference to running a business. All this in 45-minute sessions. Every keynote speaker was inspirational, engaging and got the audience involved. Emcee Dave Morris kept us engaged, while the keynote speakers kept us inspired with their stories, experiences and ideas while still keeping it light. I found PCMA CIC 2018 to be among the best I have attended. The venue and location were great as everything was within walking distance. There were many opportunities for networking and the content was informative, inspirational and delivered with a good dose of humour. Contact us if you want to learn about innovative ways to engage your event attendees.